How does one maximize a garment’s wearing options with style? By not deciding! Before you tell me I’m crazy, listen. 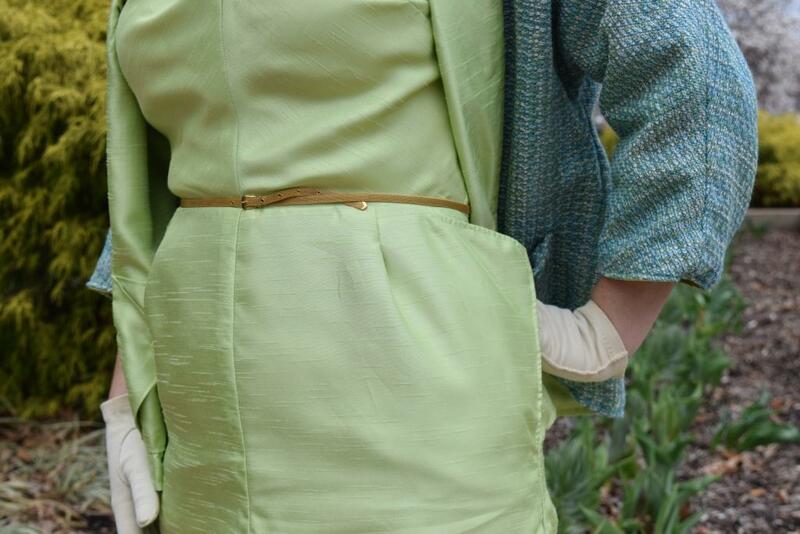 You see, when I was planning to sew a 1967 suit set, and I had set my heart on two fabrics for it, I thought why not just go all out and make it reversible? I had equal amounts of a lovely lavender linen and a fleur-dis-lis printed cotton, both of which I saw as meant for one another. I wasn’t willing to hide one or the other to use as a lining, and using them separately just wouldn’t have the same effect. Making a reversible suit set sure solved the problem of which fabric to choose, and it also gave me a darn good challenge, to boot…especially since my pattern was lacking instructions! I had to count on my sewing smarts to get me through! FABRIC: The one fabric is 100% linen, in an open woven blend of the lavender, lilac, grey, and purple. The other fabric is a 100% cotton in lavender, with a purple geometric Fleur-dis-lis print which has a slight metallic silver sheen printed over it. TIME TO COMPLETE: The set was finished on May 24, 2015, after maybe 25 to 30 hours spent. TOTAL COST: Everything for making this project was stuff languishing in my different stashes for many, many years, so I’m counting this project as free! I will admit that I had ‘support’ for my idea from a major fashion figurehead – Chanel – and an outfit of hers with a dramatic story behind it. I’m talking about a suit set that she designed for her Patrimoine collection which was showcased in Marie Claire magazine No. 181 in September 1967. It looks like a dress in a violet tweed with a reversible, or at least contrast lined, jacket and hiding helmet-style hat. This Marie Claire magazine article was part of a daring and little known contest they hosted between Andre Courrèges and Chanel. 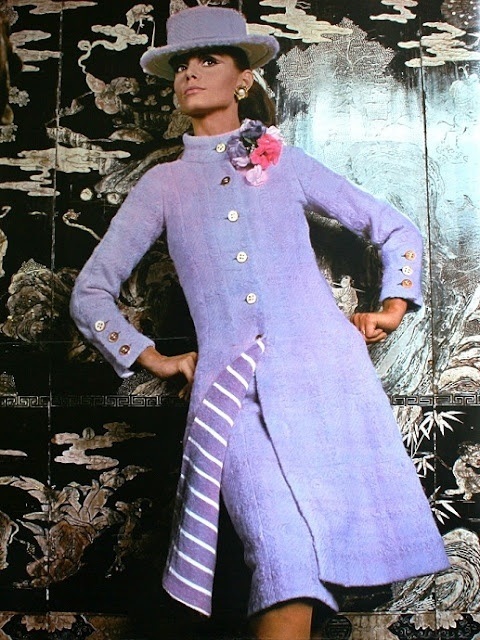 Thus, the violet tweed outfit that was my ‘splashboard’ was the best of what made Chanel, well…Chanel, still presenting appealing yet classic designs in the crazy decade of the 60’s and setting her apart from her modern peer Courrèges. A woman’s suit, traditionally a man’s garment decades back when she was beginning her career, is Chanel’s specialty, along with that elegant “distinction” which her designs have. The youthful, bright designs of Courrèges (such as the go-go boot or mini skirt), by the very way they fit, are cut, and worn, bring the body close to one’s sensibilities and contrast in bold terms with Chanel. (More info can be found in the book “The Language of Fashion” by Roland Barthes, Chapter 11, pages 99 to 103, you can read some of it here.) More or less, Simplicity was offering a very high class design here. For some reason, I feel that my reversible suit dress set from 1967 is an unorthodox mix of both Chanel’s dignified tweed design (with her soft feminine colors to boot) and the youthful, arm baring, modern aura of a Courrèges creation (my cotton print does have shiny silver, his preferred color besides white, and it is a junior’s pattern). We were at a contemporary art museum for these pictures after all, yet many of my poses are dignified for even more contrast. Hopefully, in my 1967 set, the contest between Chanel and Courrèges from years back is now a tie. To the actual sewing, I more or less made the entire dress and jacket in double, with all edges inside itself. There was so much turning of edges, pinning, top-stitching involved! I eliminated all facings (of course) and instead ironed on interfacing inside where facings would have been. Luckily this dress did not need any adjusting to fit me other than the changes I made to the pattern already at the cutting out stage! The two biggest challenges to making this suit set reversible was the shoulder pleats to the dress and the button closing to the jacket. The dress’ shoulder pleats are more akin to an overlapping fold, or technically a knife pleat, which runs right along the outer sleeve edge. To make this work on a reversible dress, I did these folds last, and stitched them down individually. There are four in total – one on each shoulder and one on each fabric side – and make things only slightly bulky (nothing a good ironing can’t fix), but at least the original design lines are kept intact. 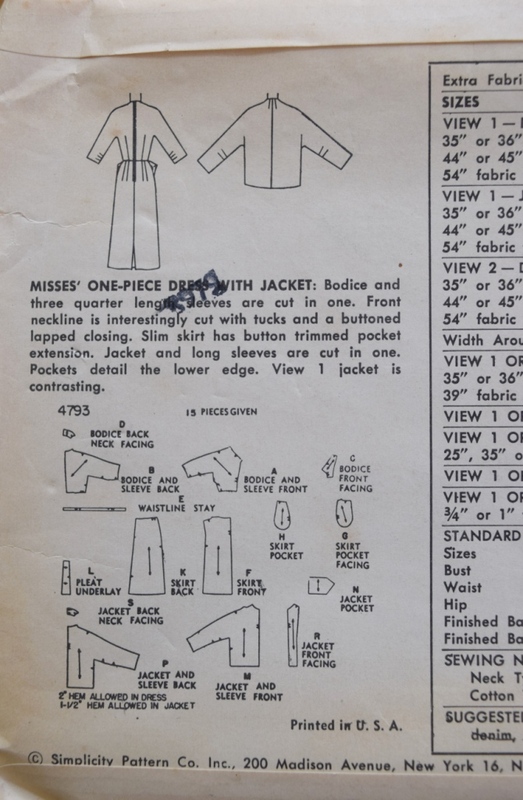 For the jacket buttoning, I went with a method which was popular in the 1930’s when delicate closures could be smashed through rough treatment from roller style wash machines – removable buttons! Both sides of the jacket opening edge have button holes. This way my buttons can be placed in the correct side, whichever that may be, for the right and the left change up when my jacket is reversed! Vintage 1930’s buttons had a metal look which used a ring or a pin to keep them in place in the buttonhole openings (see pics of that in detail on the “Vintage Gal” blog), but I didn’t have that advantage here. Again, my indecision saved the day for my outfit! As I couldn’t choose between some large satin finish pale pink buttons or fancy deep purple shell ones, I used them both, connecting them underneath with a ribbon tie. Making the buttons reversible actually worked out very well, because the second button behind whichever side I use acts like a backing to keep them in place in the button hole opening. Next time you make something and want to use some precious or fragile buttons, or even if you want something reversible, remember to make both closing sides with button holes and make your buttons removable in one way or another! A little ingenuity can go a long way to solving problems. Even though my fabrics are not busy, I’m disappointed at how they hide the graceful style lines to this set. You can’t really see, but the dress has these shaping side bust panels that arch down from the back neckline darts, swoop under the bust to head into and around the back just above the waistline. So lovely! This way there are no darts or other means of shaping besides a well-tailored panel which brings in a curve over the chest and high waist, unlike many other fashions for juniors from the same time (mostly non-body conscious A-line dresses and loose “baby doll” styles). With such a shaped dress, a short and boxy jacket (which has French darts and an arched side seam hem) actually works much better than I’ve ever come across before. I’ve always tended to dislike boxy jackets – I find them hard to pair with most of what I wear or have in closet, and never before found a way to like one so much on my body. I love it when utilizing both my sewing and vintage styles opens up a way for me to like something on myself I’ve always avoided before. It is hard for me not to like anything in any shade of purple, anyway! Oh yes, I can’t forget to talk about the back zipper! I’ll confess I made things hard on myself here by using a “normal” modern zipper. I know they make reversible zippers, but buying one 22 inch length would get pricey and finding one that match would be more challenging, so I merely used one that was on hand. For the first time I switched to the lavender Fleur-dis-lis printed side out, it originally was quite tricky to zip closed the dress on myself grabbing the pull from the inside…a bit stressful, to tell the truth. To make things easier, I later used my jewelry making skills to attach a double jump ring to the small zipper pull so I could add a decorative metal Fleur-dis-lis charm. This charm makes the zipper pull easier to find and grab so I can close my dress no matter which side I wear without freaking out, stuck in a bathroom changing, with the back of my dress open (it has happened, can’t you tell). Besides, the charm hanging at the back of my neck is quite, fun, and quirky. Also, in my opinion, and there is no such a thing as Fleur-dis-lis overload. There was a storm blowing in when we took these pictures, and as my hairstyle did not hold against the humidity, I resorted to using a vintage scarf which actually worked out quite well. I think it conveys modernity, youth, and movement (Courrèges influence), as well as keeping my outfit from being too stiffly dressy, although I am wearing pearls…so very classic Chanel! My shoes and gloves are vintage pieces, too. The gloves have a scalloped edge, much like my suit jacket, and I think my shoes are very similar to the ones drawn on the middle model of my dress’ pattern cover! I really enjoy reversible garments – I love how they offer optimal wearing options, and prompt me to nicely cover up all edges for a nice finish! Not too often do I come across a garment with more than one wearing option – changing up one’s look with a single garment isn’t an option that I see in ready-to-wear, unless it’s travel-themed clothes. I now have many pairing options for the effort of sewing one relatively simple suit set. I feel like I’ve maximized some of my time and the space in my closet without compromising style. Yet, reversible clothes doesn’t have to mean simple design…I’ve just proved that with my crazy sewing experiment. What do you think of reversible clothes? Have you worn anything reversible, or made anything reversible? Do you prefer the style of Chanel or of Courrèges for the 60’s? In a world where amazing vintage designs need upscale occasions in order to be made, what could be a better day than Easter to go all out with pretty pastels and fancy fabrics…complete with an ostentatious hat! This suit set pays homage to what I think is the best the 1950’s has to offer in elegant design and interesting details. 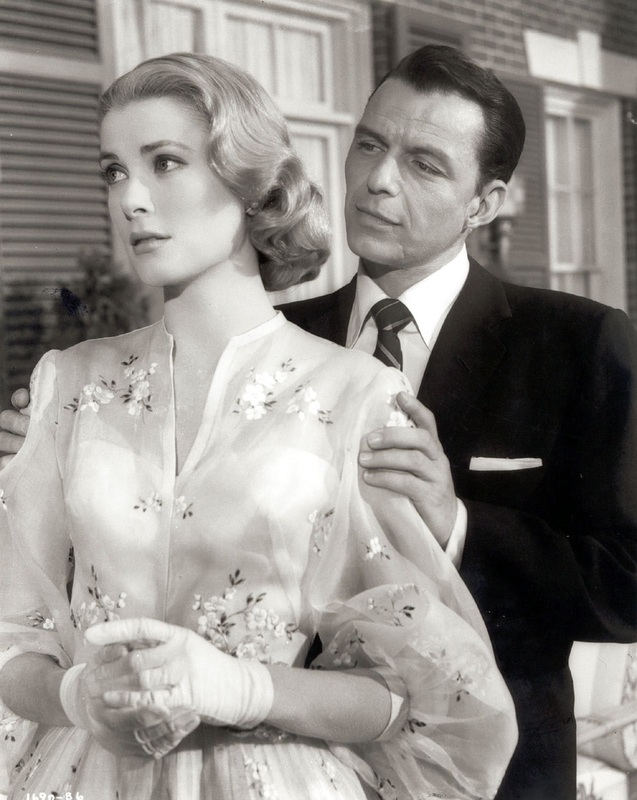 My hubby’s first spoken adjective for this duo was the term “swanky”. 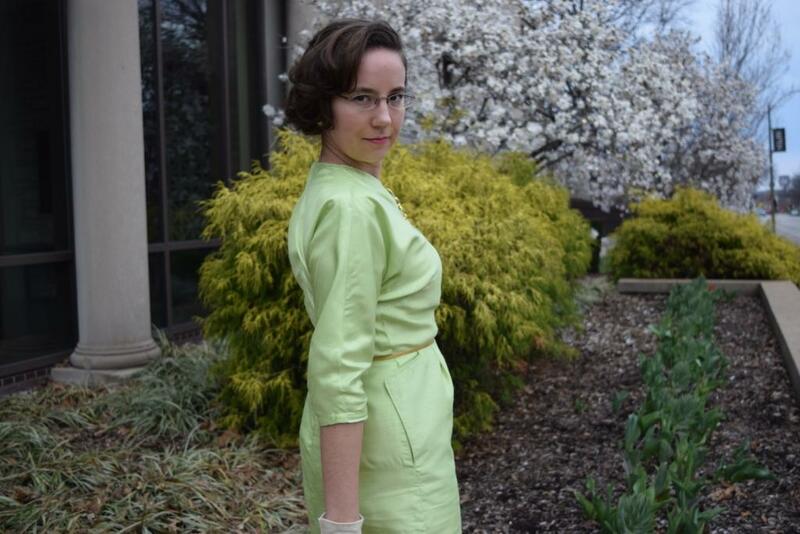 Either way, I so enjoyed the challenge of sewing this dress and jacket, and wearing them is a like an upscale dream. I’m showing off my new best clothes, too, you spring buds and flowers. This is part one of a two part post set. 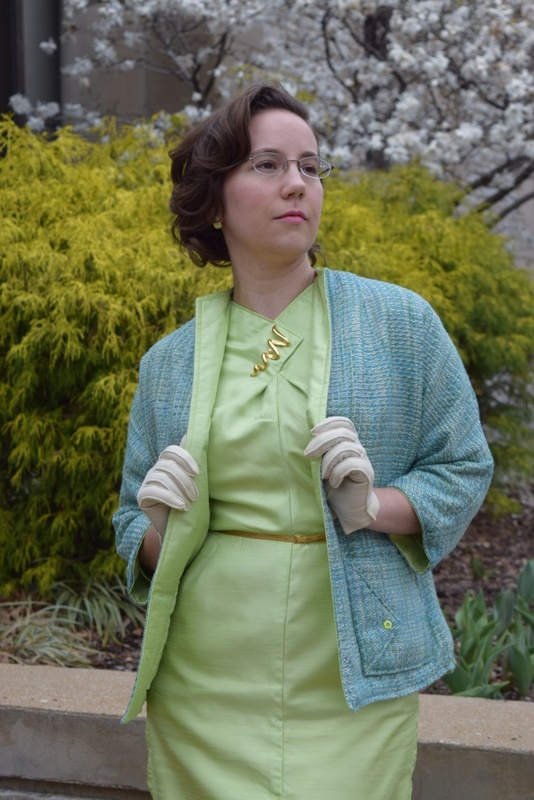 The jacket, being reversible, can be worn with more than this Easter dress, so part two post will show the other pieces I made to match with the leftover fabrics for a complete four garment ensemble. Sorry if it sounds like overkill, but I really like versatility and using up all the material on hand…besides when an idea strikes, sometimes I have to listen. FABRIC: 100% polyester shantung for the dress and jacket and a boucle, in a rayon/acrylic blend, for the jacket, as well. A small amount of scrap lining from on hand went into the skirt panel. NOTIONS: I already had bought most of what I needed (thread and bias tapes) to make this set when I decided on it the year before, but I did have to go back for more thread and a zipper. The buttons were already in my stash as were the shoulder pads. TIME TO COMPLETE: The dress took maybe 20 hours (maybe a few more) and I spent about 15 hours on the jacket. 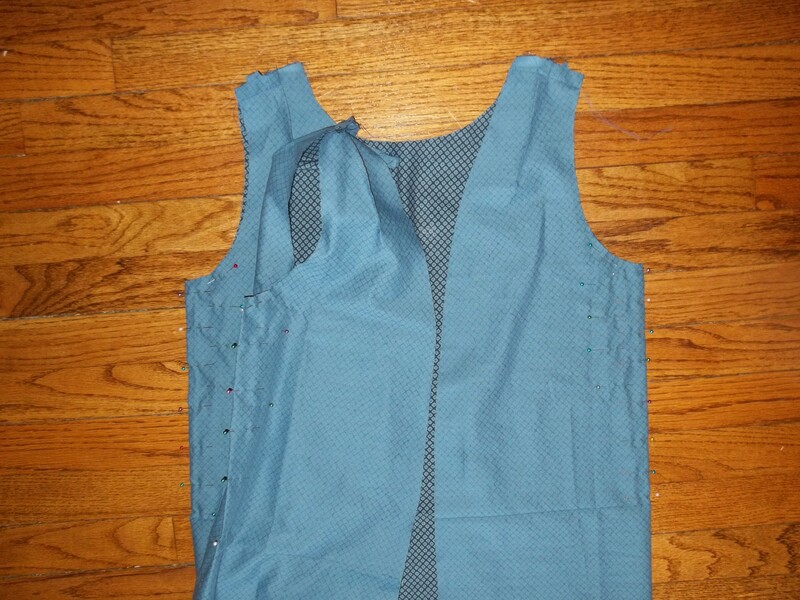 THE INSIDES: My dress’ insides are all smoothly bias bound while the jacket is reversible, so…no seams! TOTAL COST: Both fabrics were bought on clearance at Hancock Fabrics store. Each fabric was dirt cheap at about $2.00 a yard. So, for 1 ½ yards of boucle, and 2 ½ yards of shantung, I spent maybe $10.00 in fabric and another $5.00 in notions for a total of about $15. Not bad! However, one yard of the boucle went towards another garment to match the jacket. This is another one of my ‘consecutive decades’ Easter outfit. 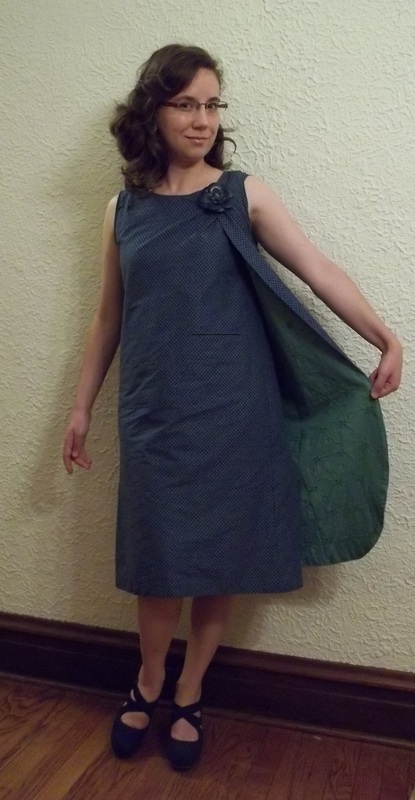 In 2012, I made a dress from the 1920’s (year 1929 to be exact), and year after that I sewed a dress and slip from the 1930’s (a ‘feed sack print’ silk set from 1935). Last year I realized the “hop” up in decades I was doing and continued it by making a 1940’s dress (in rayon floral from 1944). 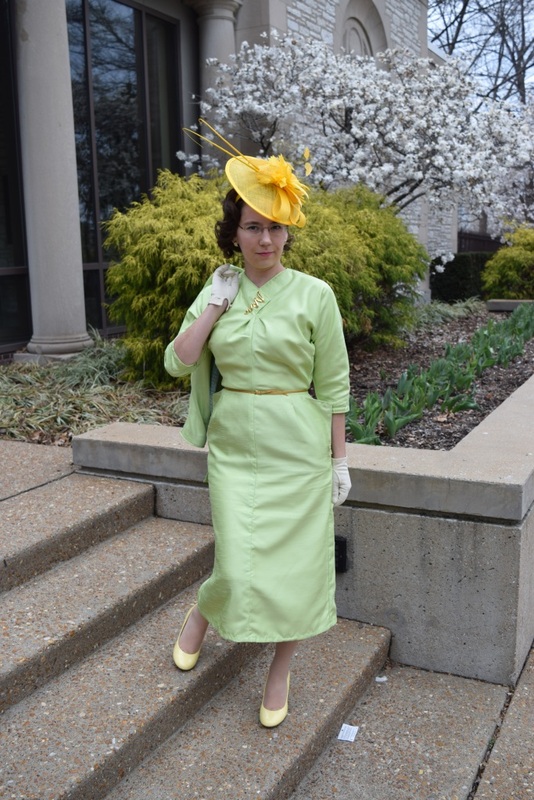 I’m just keeping this “thing” going by making a 1950’s Easter outfit. I’ve already picked out my 60’s dress suit set for next year, with a special hat to match, too. I know, I know, you might be thinking, “What will you do going up to now when you run out of decades?” I’ve thought of that. My sewing plans might be to go back to the 20’s and start over again or even go fashion-forward or futuristic…that will be figured out when I get there. 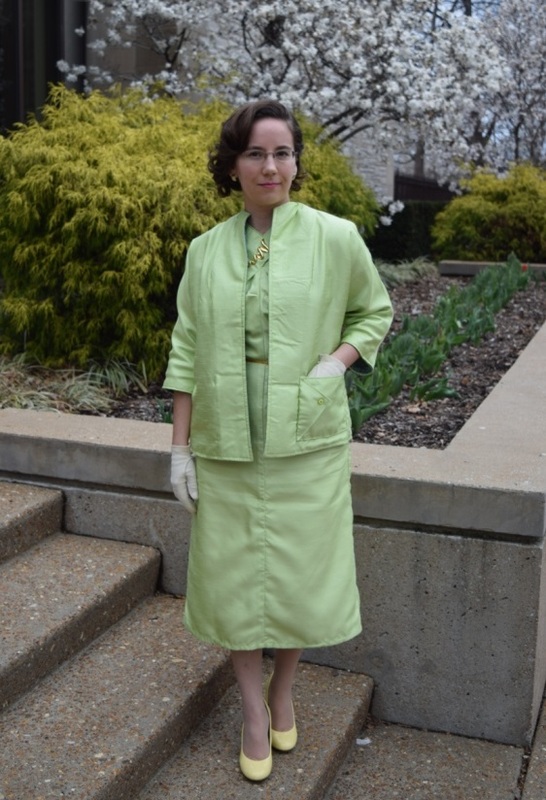 Looking at it you probably won’t believe me, but my 1954 dress set is by far my easiest Easter creation. It involved some tricky sewing parts, which I enjoyed and learned from, but nothing that I couldn’t still zip through. This was one Easter outfit where I was super unsure about whether it would fit, whether it would look weird, or if I would even like it at all. Part of the problem responsible for such doubts, I think, was the shantung fabric. 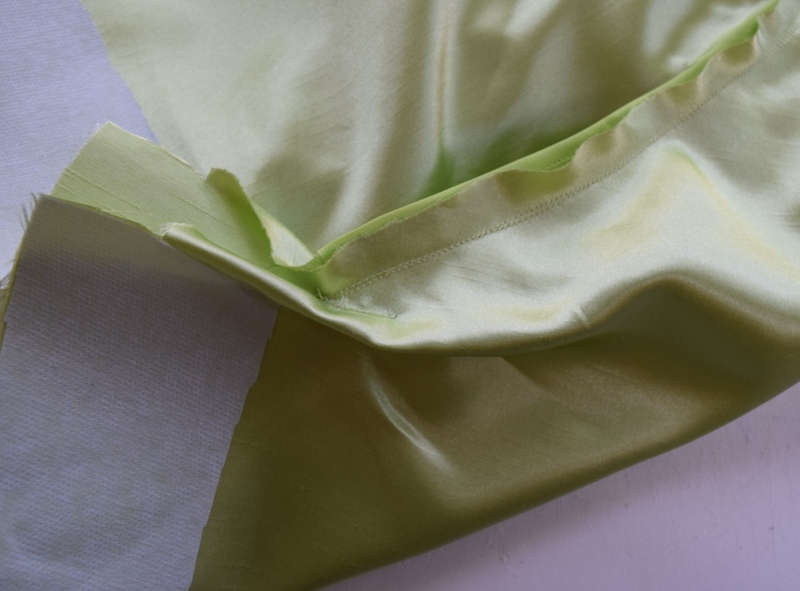 Artificial shantung is a new fabric for me to work with, and I am on the fence about it now, too. I find myself impressed with it only as long as it is nicely ironed, so it was hard to tell how it would turn out as I was sewing with it. Fancy appearance aside, wearing a tightly woven polyester that doesn’t breathe is not a very pleasant thing for me unless the temperature is comfortably just right (otherwise I either freeze or sweat to death). Any raw edge shredded like crazy and there is an ugly shiny side to it, as well. However, the nubby side is nice and classy and comes in a lovely, tempting variety of colors at my local fabric stores. The stiffer “hand” to it is fun because it’s something I don’t usually work with, but a bit to artificial in texture. Surely the real shantung in silk is much, much better and I think it (the fabric) deserves another chance to redeem itself to a higher par in my estimation (hint, future costly fabric purchase, hubby). The neckline of the dress was a tricky spot that actually stumped me for a while. My being stumped by a technique only comes around every so often in my projects and I like it. I need to find more projects that threaten my ‘comfort zone’ of sewing skills and push me to figure out something new with a great garment waiting ahead as the motivation. I worked on the dress first, then was confused by the neckline, so I put it aside to make the jacket so as to get a breather. Sometimes walking away from a sewing technique refreshes my mind enough to figure something out but sometimes also it only takes my sitting down and working with it, too, which is what happened once I tried. Pinning it this way and that, I realized you make some sort of tuck horizontally slightly parallel to the top end of the center front seam. What a very smart construction…good for expanding one’s sewing ability. 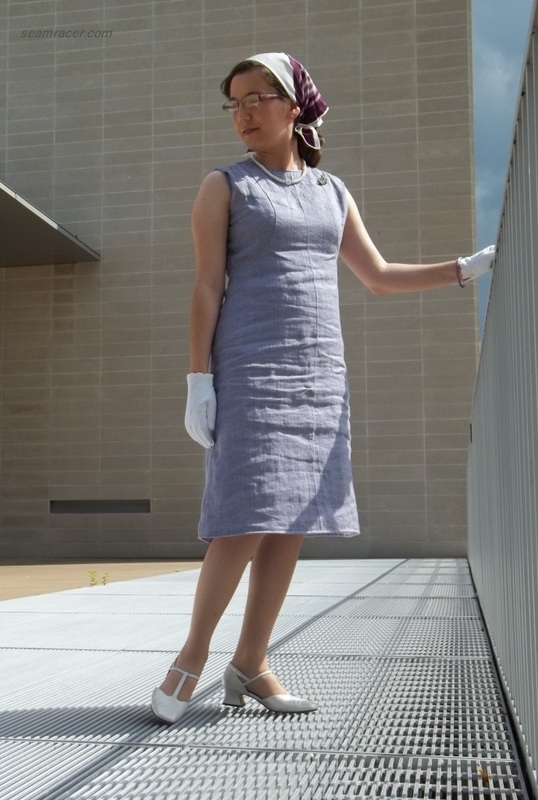 This dress’ neckline does strongly remind me of another pattern, Burda Style’s 1960 “Vintage Boucle Dress”, except here the same detail is softened in its corners and sent to decorate the waist. My neck fold over detail was at first just kept in place by my pin (which I’m not sure if it’s from the right era but it looks good, I think). Then, I went back to tack down the edges in three small places so I don’t specifically need a pin to keep it closed. Tacking the neck detail does unfortunately make it blend into the rest of the dress more than I would like, though. The dress’ bodice is cut on the bias with the grain mitering into the center front and back seams. 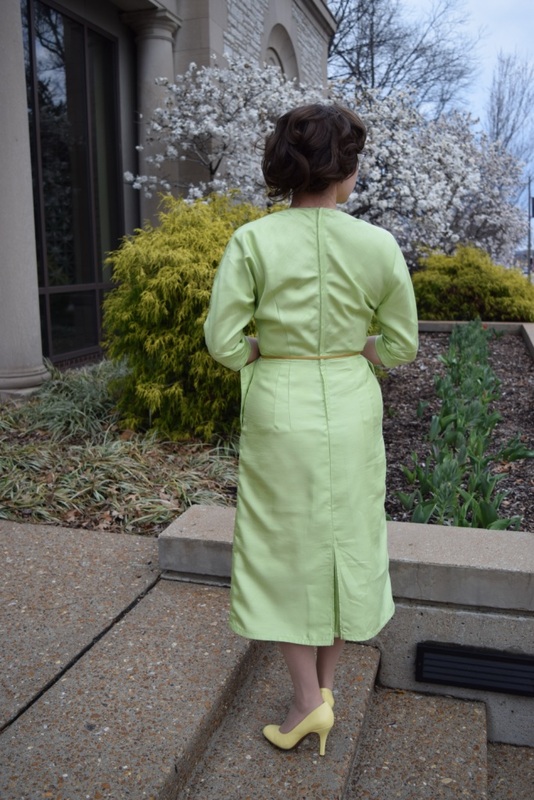 When wearing this I can feel how the bias helps the kimono sleeves, and both the bias and sleeve style make it surprisingly easy to move and reach in. I have larger upper arms, so many cap sleeves, shoulder caps and armscyes (without adjustment) do not provide me enough ‘give’ to do things, but this dress’ bodice is wonderful for me. It also hides my upper arms, tapering them by actually making my shoulder line softer and larger (thanks to shoulder pads, too). The decade of the 1940’s also knew the “large shoulder” trick actually makes one’s waist look so much smaller than reality, but the 50’s took things one step further by widening the hips, too, which is where my dress’ pointed extending pocket flaps come in handy. Appearances are everything for me to rock a proper 50’s silhouette as I do not have “traditional” 50’s proportions like Marilyn Monroe and others of a bigger bust and a tiny waist. Speaking of a tiny waist, the skirt portion to this dress is very body hugging – it is a total wiggle garment. Somehow, between the way my hips are hugged in the fabric, the slightly confining skirt, and the high heels I’m wearing, I do end up with a swagger from the bottom down when I walk and it feels perfectly natural. I love it! The skirt does have a rectangular insert panel to the back skirt vent, making it modest and looking more like a box pleat. I don’t do long strides in this dress, but the vent still helps with movement. There are the standard 5/8 inch seam allowances in my dress, so I have room to let things loose if I suddenly decide on less of a “wiggle” skirt. 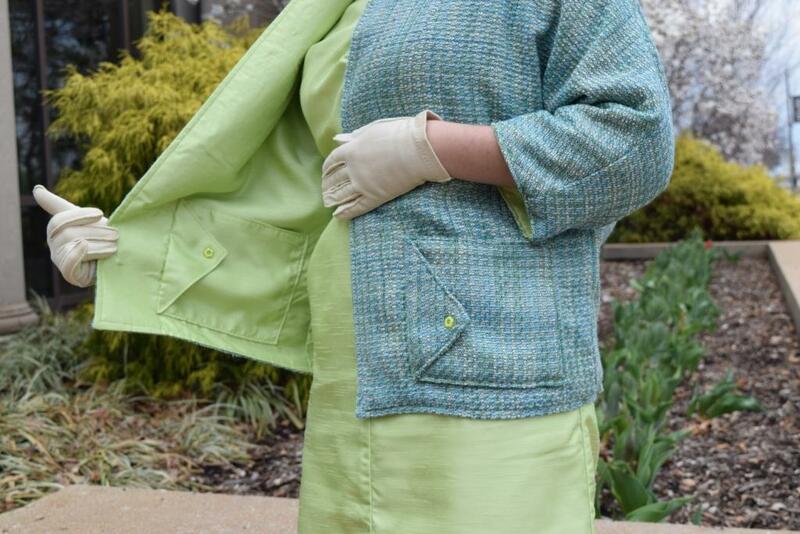 For the jacket, I couldn’t decide which material I wanted to wear with my dress…the matching shantung or a contrast boucle…so I figured, why decide on one when I can have both! I simply cut both fabrics out of the exact same jacket pieces (in lieu of cutting one smaller as lining). 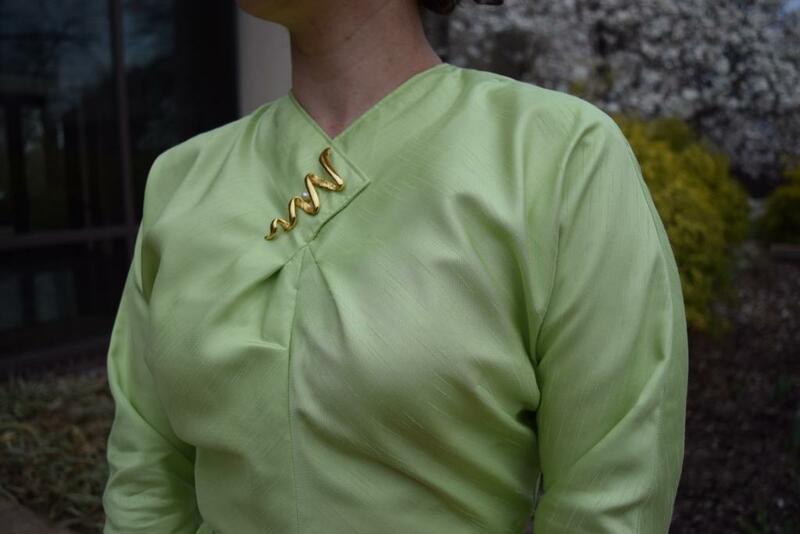 The facing pieces for the jacket were cut out of interfacing and ironed on the wrong (shiny) side of the lime shantung for support along the neck and front edges. Then both jackets were sewn together except for a small hole at the back bottom to turn the whole thing right sides out and roll out the edges to top-stitch them down. Check out those amazing, unique pockets on the jacket! To me, they look like postal envelopes for letters. They were stitched on the jacket before the two fabrics were sewn together into one because I didn’t want the stitching showing on the other jacket side. My pattern shows two make two pockets, one for each side, so I improvised and still made two, just out of both fabrics with one pocket on each opposite side of the jacket fabric. Now, no matter how I wear my jacket there’s one pocket inside and one outside. The side fold ‘envelope flap’ is purely decorative and the entry for both my hand and whatever my pocket will carry goes in from the top. The jacket is really surprisingly warm, which is exactly what I need for this year’s Easter. 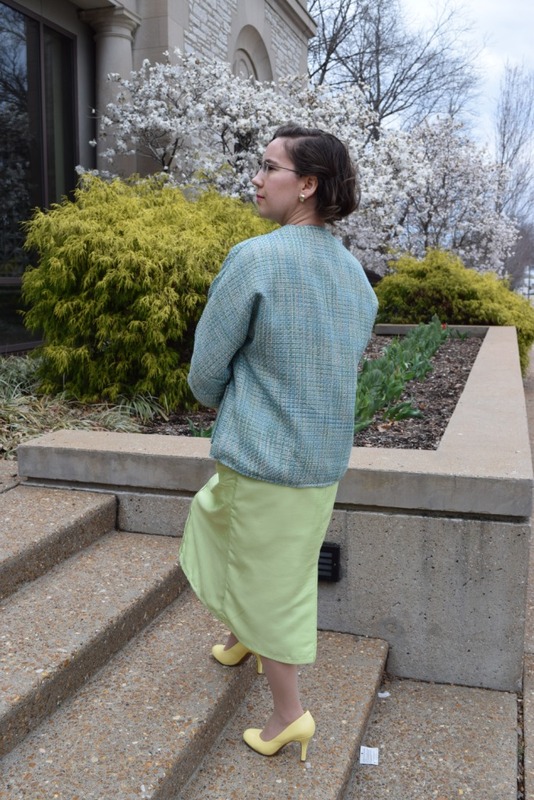 This year, Easter is quite chilly still and rather overcast, but the shantung not being breathable together with the plush loftiness of the boucle makes for a jacket that traps in my heat and blocks out any chilly wind. Didn’t see this one good benefit coming but it’s most welcome! 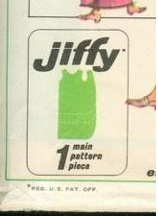 No changes were made to the design of the pattern, other than for fitting. I did grade up slightly in the dress for my waist and hips, but did not do the same grading for the jacket. 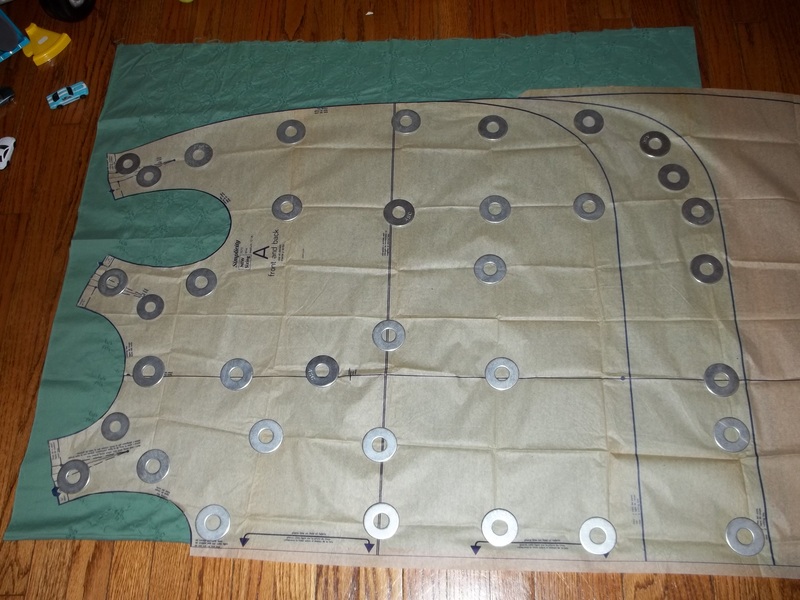 I also switched up the construction method so as to make my dress easier to fit, if needed, by making the entire front and the entire back (meaning both skirt and bodice together) so I could sew up the entire side seams as one continuous seam. Many 1950’s patterns have long back bodice torso lengths for my proportions, so I shortened the back bodice by 5/8 inch. This way I avoid the ‘bubbling out’ of the zipper like I have a hump back all because of too much fabric. After making clothes from every era, it really helps to remember to have some foresight and look out for fitting trends I’ve notice with certain decades’ patterns. Now, if you’ve made it this far in my post…thank you so much! 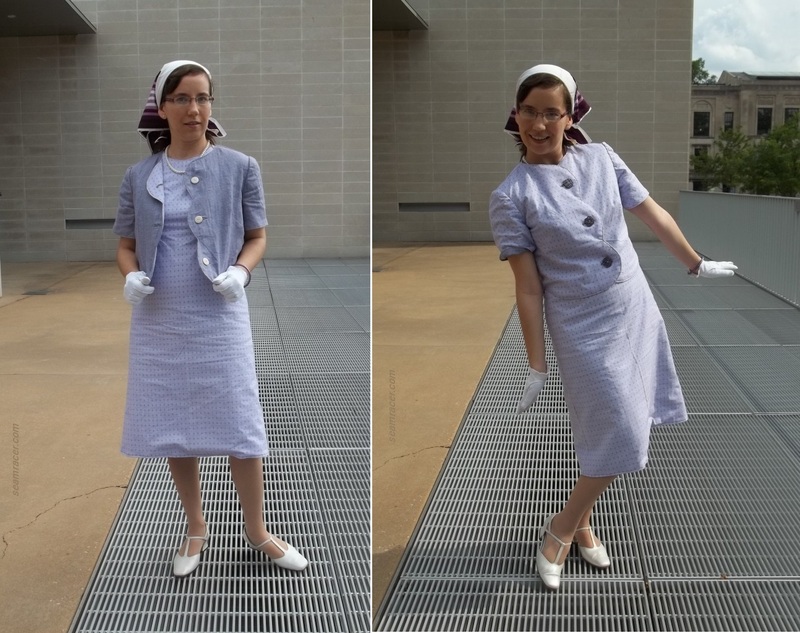 I am quite proud of my outfit which is probably one of the main reasons for being so long-winded, but this project was also quite interesting for me with many special details to share. I hope you like it as much as I do. Do you also like to treat yourself to a new handmade outfit, whether dressed up or down, which makes you feel special? I can’t wait to hear (or see) what you have all made for Easter or spring, too. It’s time to highlight an inventive fashion oddity from the past. No, the three-armhole, wrap-arounder, Simplicity #7572 “Jiffy” dress pattern was not meant for ladies with three arms…just for the modern woman on the go. In the blink of an eye, this dress is on and ready to be worn as is for and easy, breezy look, or accessorized in a myriad of ways for countless different options. I maximized on the countless options of this wrap-arounder dress by going through the extra thought, fabric, and time to make my version reversible. Two looks in one easy dress, in one simple pattern piece, using a small amount of fabric! This is my first reversible clothing creation, as well as the first pattern I’ve used from my mother-in-law’s pattern stash which I now keep. Although the instructions for Simplicity #7572 lists a date of 1967, the envelope says 1968 – and, considering it to be from ’68, would make it my third project from that year (click here for #1, and here for #2). My #2 1968 dress is also coincidentally very close to being reversible, as well, while my dress #1 is another “Jiffy” pattern. It seems that three-armhole wrap-arounder dresses were something of a fad in the late 60s. 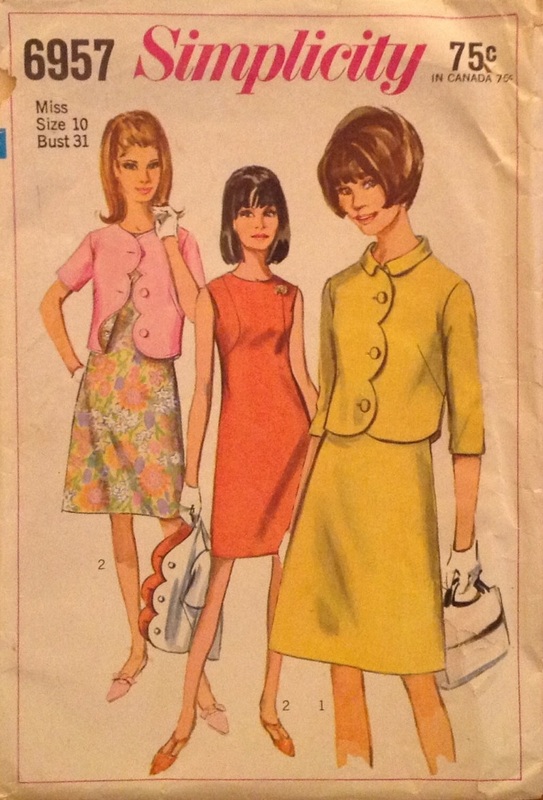 A great page about “What is the three armhole dress?” can be found by clicking here, where the “Patterns from the Past” shows at least nine (six for women, and three for girls) wrap-arounder dresses which were released between 1966 and 1969. 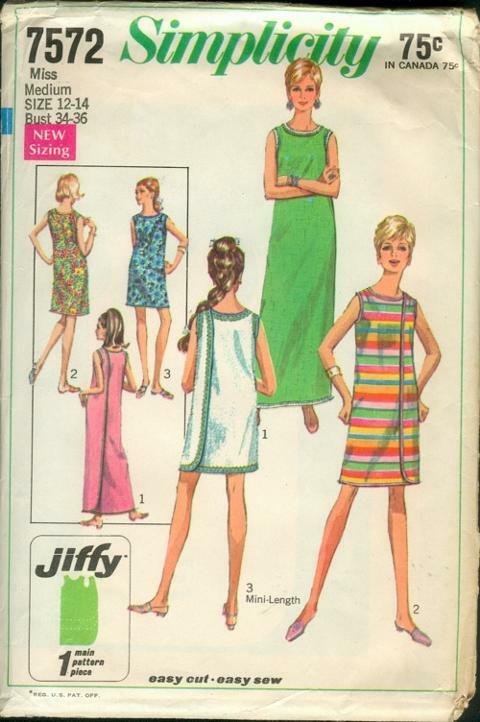 All nine of the dress patterns were all categorized as “Jiffy” projects, with minimal tissue pieces to use and relatively quick time to completion. 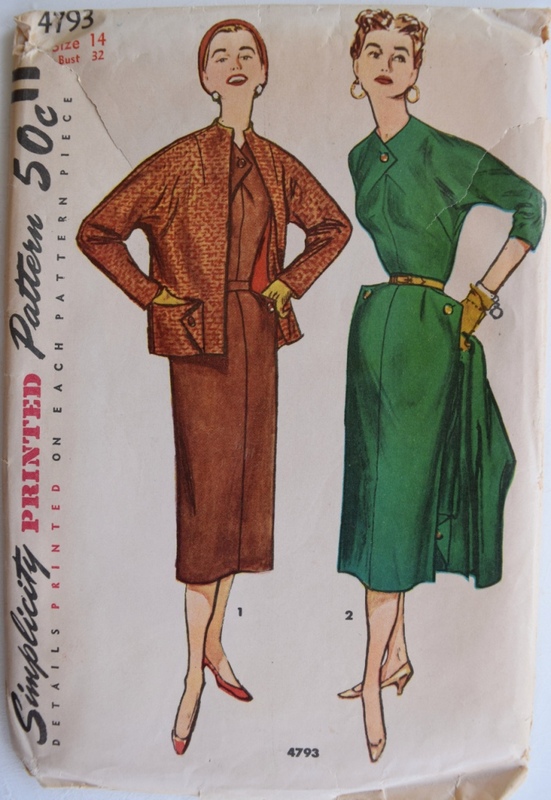 As is shown on “Patterns from the Past” blog, Butterick, McCall’s, and Simplicity all came out with their own versions of the three-armhole dress, but apparently the term “wrap-arounder” is technically a trademark of McCall’s corporation. (“Patterns from the Past” sells patterns, too – see here – so she should know a thing or two.) “Woof Nanny” also has a blog page here about the wrap-around 60’s fad, and she shows a few more three-armhole patterns that aren’t seen on the “Patterns from the Past” page. Some wrap-arounder patterns have collars, some have fringe, and some are made out of towel cloth…but they are all share the same basic, but short lived creative design. As far as versatility goes, this dress design banks in on the ingenuity factor, quietly offering a seamstress endless opportunities for creativity and ingenuity with a seemingly mellow pattern cover that is not fetching, just curious. 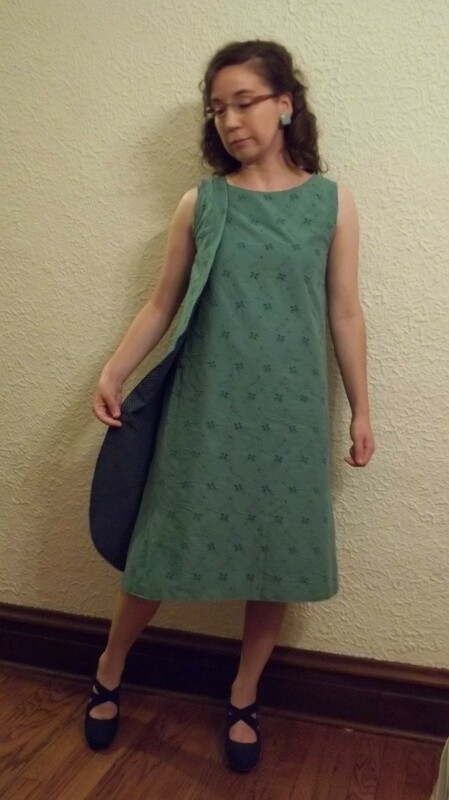 Maggie at “Vintage Core Patterns” made herself a cute version of Simplicity #7572. 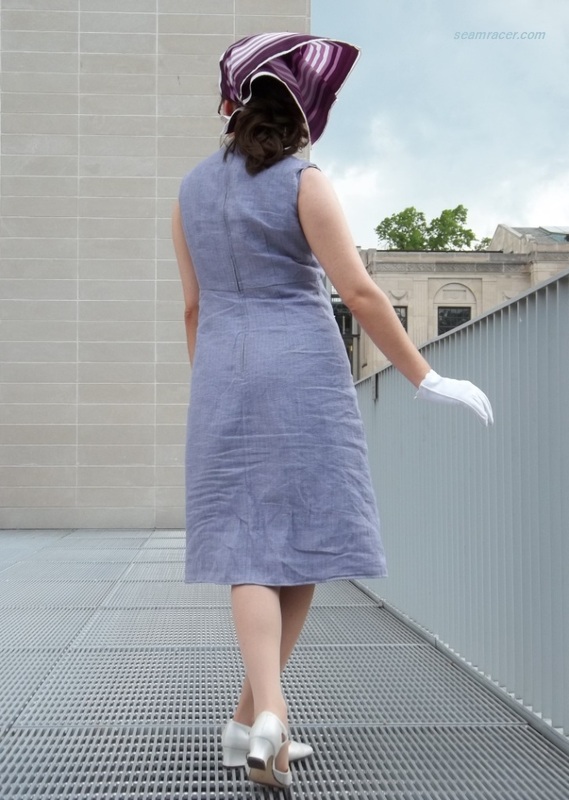 My hubby and I have come up with a plethora of ideas ourselves for this pattern, so I have a feeling I’ll have some more creative variations of the 60s wrap-arounder dress in my future. Looking at some comments on this subject in the internet blogging world, interesting variations of the three-armhole dress have already been thought of years ago. Both of the blogs I mentioned in the paragraph above (“Woof Nanny” and “Patterns from the Past”) have some comments at the bottom of their pages that are left by people who made these wrap-arounder dresses when the patterns were first released. 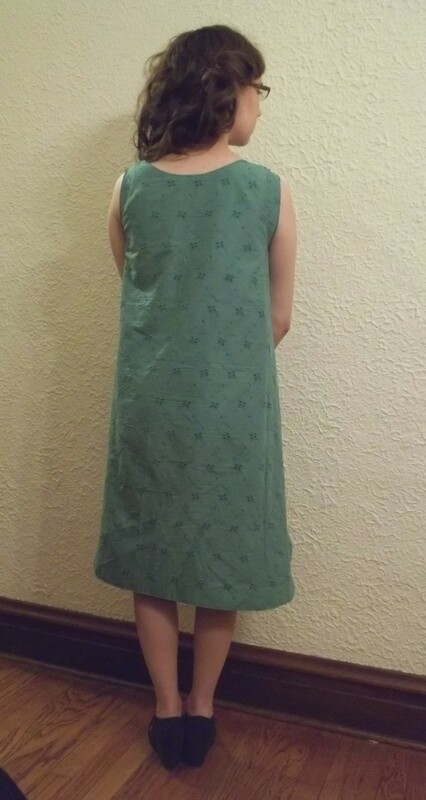 One comment said their three-armhole dress pattern was made to be a full body apron to cover their Sunday best clothes, while another comment said it made an easy-to-get-on dress for a girl with a cast on her broken arm. Many of the comments were remembrances of how the wrap-arounder dress was their first clothing project for ‘home economics’ class in school. Read the comments for yourself and be amazed, like I was, at how such a simple design brings back memories and brings out peoples ‘creativity. It’s a shame these innovative wrap patterns are generally unknown nowadays! FABRIC: As this dress is reversible, it took two different fabrics: 1.) 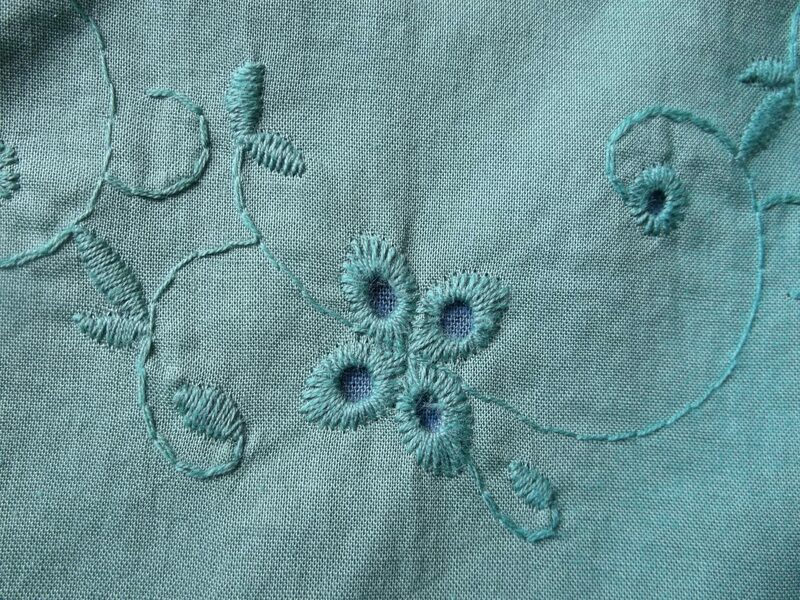 a cotton, embroidered border eyelet in a dusty aqua color, and 2.) a printed quilter’s cotton which has a solid blue on one side and a navy basket weave print on the other side. Both fabric pieces are cut at just under 2 yards. 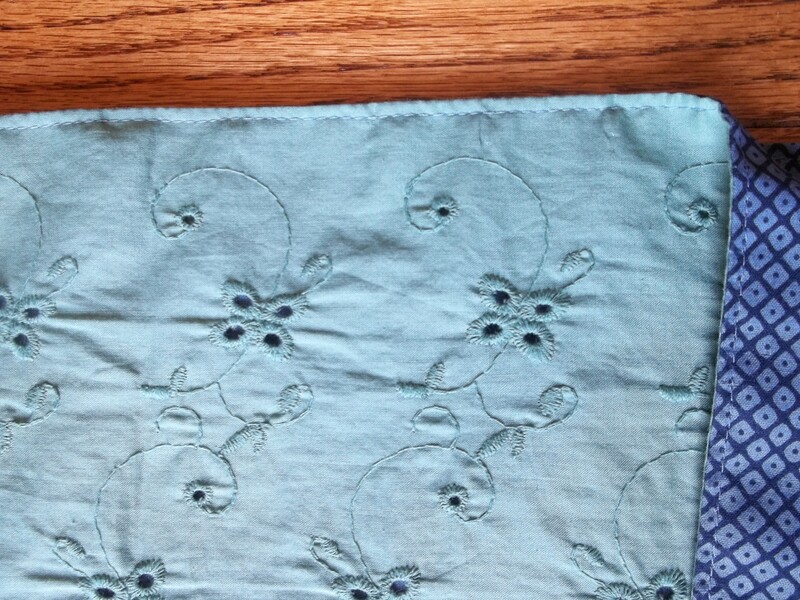 You can see, in the picture at right, what both fabrics look like in detail, and also how I lined up the embroidered border to end just above the bottom hem. NOTIONS: I bought a spool of dark aqua dual-duty thread. This was the only notion I needed to make this dress. PATTERN: Simplicity #7572, (picture at the top left) with a date of 1967 on the inner instructions and a date of 1968 on the envelope. I chose to make view 2, the mid-length version. I can tell from the markings and cuts that the pattern had been made up in the mini length version, and, as this comes from the stash of my mother-in-law, I wonder who in the family made and wore their version of Simplicity #7572. TIME TO COMPLETE: Making the pattern up exactly as instructed, I can see this dress being a 3 hour quickie project. However, leave it to me to make this harder! I ended up fitting the dress at the armholes somewhat (I’ll explain more down later), and the reversible part of the dress took extra cutting, top stitching, seam turning, and pinning time. 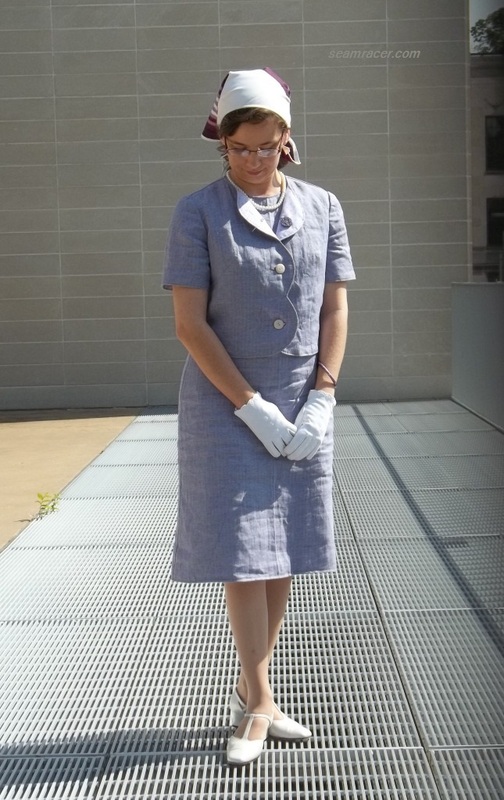 Altogether, I think my version of Simplicity #7572 dress was completed in 6 or 7 hours, and was finished on June 20, 2014. THE INSIDES: What insides? All the seams (which aren’t many) are, well, tucked ‘inside’ both fabrics because my dress is totally reversible. TOTAL COST: The aqua eyelet fabric has been in my stash too long for me to remember when I bought it or where it came from, so I am counting it as free. The cotton quilting cotton for the other reversible side was bought at Hancock Fabrics just recently. Thus, between buying the one fabric and the one spool of thread my total cost for my dress is under $10.00. The size of the pattern is a medium, and I really needed a small, so I correctly estimated I would have to do some fitting to trim down both the appearance and fit. First, I cut out and sewed up the two different fabrics like two separate dresses making no changes to the pattern whatsoever. The pattern piece is one, gigantic rectangular style shape which you cut on the fold to end up with six total armholes. (Pardon all of our son’s toys in my layout picture). Every two armholes get sewn together after a small shaping dart is sewn into each one of the six. After this stage, I was able to try on a single layer of fabric and realize where and how much to bring in. I ended up taking in my dress, just like a giant vertical dart, from the center under arm down to an inch above the bottom hem. This made (more or less) three giant side seams, and I had to do this adjustment exactly the same on both fabrics. Personally, I took in all the darts at 1 1/4 inches for the first 5 inches down under the arm, then gradually tapering down to nothing, for a total of 3 3/4 inches taken in from the bust and waist of the dress (see picture at left). Next, the two fabric dresses were joined, right sides together, and stitched all along the outside seam…all the way across the neckline between the three armholes, down the two vertical edges, and also the long bottom hem. My pin box was maxed out! A small gap was left open at the bottom hem to turn the dress right sides out and turn the edges. Then the same edge had to be top stitched all the way around again! The last step was to measure and turn in the raw edges for the three armholes and top stitch them together, too. The inner raw edges and the side darts I added for fitting are actually quit invisible through the eyelet holes of the aqua side of my dress. All you see is the nice contrast of the dusty colored blue through the stitched openings of the eyelet. Wearing this three-armholed wrap-arounder dress is a process as creative as the pattern itself. Depending on how you initially wrap it on yourself, the third armhole of the dress doubles up on either the left or on the right shoulder, to “anchor” the dress closed. The third armhole can end facing in front or in back of you, as you can see in the envelope cover above. Anyway you wear it, you will always have two armholes/shoulders on one arm. See my pictures. 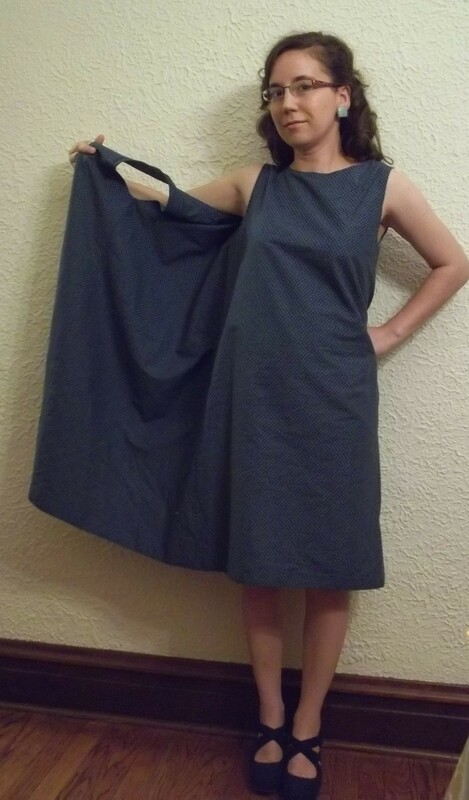 Above, I’m demonstrating how the dress gets wrapped on by wearing only two of the armholes without the third. We had to take this picture at home 🙂 If I wanted to wear the dress so that the third armhole opening would end facing the back, I would put it on exactly the opposite of how you see it in my picture. (We didn’t get a picture of that…it felt indecent.) In the picture below, I’ve switched sides fabric sides – I think I needed to sneeze too! It took me a small amount of experimenting with the dress itself to understand completely how it gets worn, so if you don’t understand my attempt at an explanation, you’re fine! You just need to make one of these dresses for yourself! As if I haven’t said enough good things about my wrap-arounder dress, I would like to add one more. I was reluctant to use my aqua eyelet to make this dress, for after saving in my stash for so long I wanted to make the best possible project. I did realize that trying to be the very best is me trying too hard, so I went ahead and used the fabric anyway because wearing it is always better than sitting for more time in the basement stash. 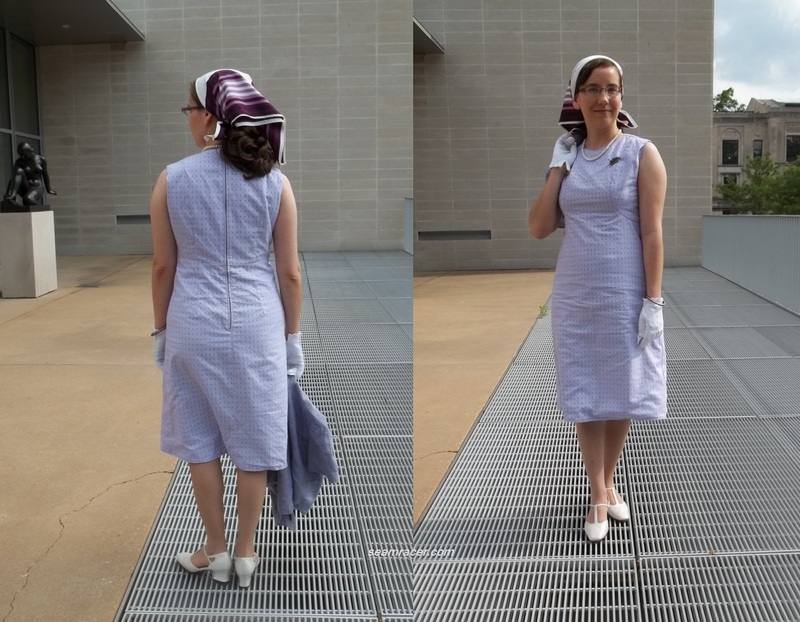 My husband also made the point that this Simplicity 7572 dress stays true to the engineer’s K.I.S.S. (Keep It Simple Stupid) principle, being practically a solid 2 yard cut, so if I ever do decide to make something else with the fabric for my dress, I can do so easily. Read how I also followed the K.I.S.S. principle here. How’s that idea for “reuse and recycle”?! My outfit is matched perfectly by some retro aqua square clip-on earrings I found recently at an antique mall for $1.00. I figured on stressing the pre-70s fashion of my late 60s dress by wearing my funky navy blue “Crown Vintage” brand wedges, which were a Christmas present from hubby. A blue suede flower pin from Hancock Fabrics closes the wrap dress’ flap in most of my pictures. I can’t wait to find more on hand to match and compliment my unusual retro creation. Innovation is everywhere. Most of what we wear, and posses, and enjoy is a product of someone’s inventive idea. We just need to keep our eyes open to see, appreciate, and spread such creative ideas, such as the 60s wrap-around three-armhole dress idea (or see my post on knitwear). It’s fun and worthwhile to let those creative juices flow!